Fiction – hardcover; Picador; 200 pages; 2005. When John Banville won last year’s Booker Prize many were surprised. Critics, from the established media and the blogosphere alike, seemed united in their distaste for this novel, deeming it unworthy (and in some cases unreadable) for the UK’s most prestigious literary award. 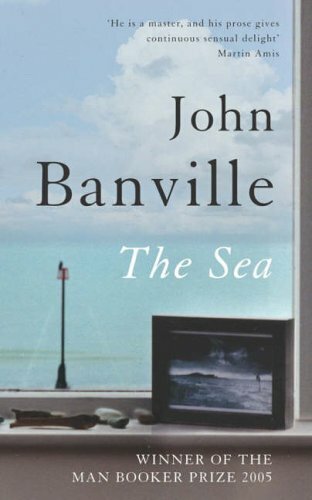 Despite being a longtime admirer of John Banville’s work (although it had been about a decade since I’d last read any of his fiction), I was reluctant to try The Sea. I did not want to have my image of his work destroyed. I did not want to discover that the critics were right and I was wrong. And so my hardcover edition sat on the shelf unread for so long that it was eclipsed by the paperback release and I was forced to read it before the paperback reviews put me off it forever. Now I am wondering why I waited so long, because The Sea is a remarkable novel — in all senses of the word. It tells the story of Max Morden, a retired art historian, who takes a trip to the seaside village (where he once spent a childhood holiday) to come to terms with the “delicate business of being the survivor” after the death of his beloved wife. The novel, written stream of consciousness style, charts Max’s interior monologue, his recollections of the past colliding with the awkwardness of his present day grief. Banville, a master of narrative, entwines several stories into one seamless, smoothly polished piece of fiction. The reader does not even notice the joins between Max’s divergent memories: his wife (meeting, falling in love, making a life together) and a childhood vacation spent at his current seaside resort, where he was enchanted by the Grace family, and fell in love, first, with the mother Mrs Grace and was then seduced by the daughter, the beguiling and forthright Chloe. Colliding with his remembrance of things past is his present reality: arguing with his strong-willed daughter who comes to visit; putting up with other house guests, such as Colonel Blunden who “overplays the part of an old soldier”, and the stern but friendly landlady Miss Vavasour; and finding things for himself to do, even if it means getting falling-over drunk in the local pub. Just as the reader begins to wonder whether there is any point to these meandering narratives, Banville does what he does best: he allows these seemingly unrelated stories to join forces. This delivers a shocking blow, so that the reader suddenly realises that Max’s grief is two-fold: he is escaping from a recent loss but also coming to terms with a devastating incident from his childhood that has shaped much of his long life. A steep-slanted flash of sunlight fell across the beach, turning the sand above the waterline bone-white, and a white seabird, dazzling against the wall of cloud, flew up on sickle wings and turned with a soundless snap and plunged itself, a shutting chevron, into the sea’s unruly back. I will be the first to confess that Banville may not be everyone’s cup of tea. But I appreciate his refusal to stick to conventions, to experiment with language and to explore so eloquently and with such clarity what goes on in people’s hearts and minds – the “grim gift for seeing people’s souls” as Don DeLillo described it. If you are after something with a straight-forward narrative and a conventional plot, The Sea is not for you, but if you enjoy stylised fiction revolving around deep themes – love, loss, identity and remembrance – and revel in the use of sublime language, then I suspect you will be just as enthralled by this novel as I was. Thank you for finally getting ’round to it. I have read everything he’s ever written and love his work. Yet, every time The Sea has come available at the library and is placed on hold for me, I let the hold lapse. I couldn’t quite sort out WHY I was letting it lapse, but you’ve hit it spot on. I didn’t want to not like him — and surely, such an over-celebrated award-winning work was likely to be fraught with I-don’t-like-his-work-anymore-ness. Right? I’m glad to hear you enjoyed it and highly recommend it. The Sea is back in my holds queue and when it makes it’s way to my little library branch, I’ll go get it this time! Thanks, Callie. I hope you find that the wait was worth it. Would love to hear your thoughts once you’ve read it. I’m really glad to hear you liked it, although I read it and wasn’t quite so sure. I felt that, whilst it was stunningly beautifully written, the plot didn’t interest me as much as I’d hoped it would. It could easily be that I wasn’t in the mood to read it at that time. Certainly he is a great master of prose. I absolutely loved this book. Great review. I also enjoyed this book. I don’t understand the critical backlash it received, as it seemed to me to be a beautiful, involving and artistic novel. Not things you can say, convincingly, about many books, I believe. I read “The Sea” a couple of weeks ago now but never got around to posting my thoughts, what with reviewing commitments elsewhere. Like litlove I wasn’t 100% convinced, although I did admire and enjoy it: the plot was moving, in parts, the prose dazzling, in parts. At other times it was unabashedly verbose – I had to pick up a dictionary for the first time in years – and so, I think, over-egged its own pudding. At times there was a gorgeous simplicity to Max’s memories and to his grief, but at others a clogging up with adjectives. I see that this was a function of his narratorhood, a part of his arrogance and his thwarted academic ambitions, but nevertheless, it grated and seemed more like Banville’s tic than Morden’s. I’ve been avoiding The Sea, too, but will no longer. Have you read any Ali Smith? She also has a phenomenal way with language. I loved “The Sea”. I came to the book without any preconceived notions and as a Banville novice. I read it in July 2006, so it is sometime ago now, but the language – its exquisiteness – remains with me. My method when I read any book is to jot down the words I don’t know and to look them up later. I find, reading “Ulysses” at the moment, I am using the Free Online Dictionary. The Oxford Edition has copious notes, but of course not every book comes with its own glossary. Banville – like a poet – opens up language. Am just scrolling thru some of yr reviews and I agree that this novel, which introduced me to Banville’s work, is wonderful. I have gone on to read “The Eclipse” and is there one called Ghosts?? Subtle work and many layered. Surprised you give this top stars. I only read it about 3 weeks ago , and had completely forgotten about it until I read this review. Not a great sign! Very unmemorable. The whole book is a build-up to a section of about 3 pages where everything is revealed at once in a rush. Like the linguistic style , but it did drag a lot in terms of plot.